What if your customers’ experience were so remarkable, they couldn’t help but talk about it? Or take photos of it? What if you invested in designing the full experience your customer has with your brand, product, and service? You could increase word-of-mouth and minimize the endless advertising loop. • You pay for your ad to be placed. • The money runs out. • Before: We design how people are introduced to your brand (this could involve an ad, but not always). • During: We design how people interact with your brand (so it’s memorable and remarkable). • After: We design how people can build relationships with your brand (this could involve an ad to remind your customer, but not always). Result: More customers have a memorable overall experience and tell others about your brand. 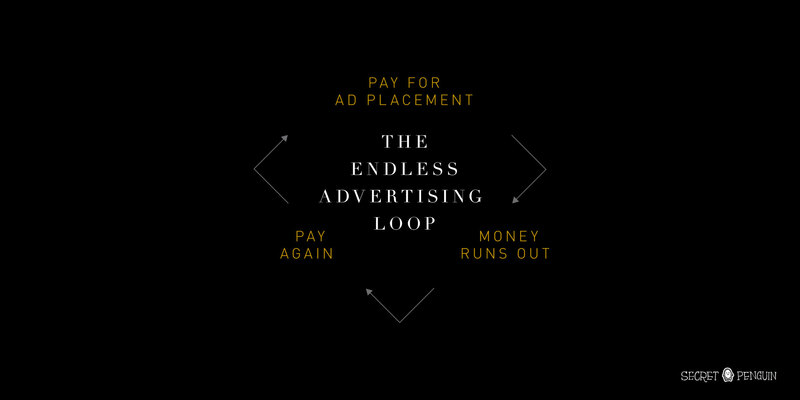 But when agencies have their revenue model based on selling you ads, it can seem like the only option. If a customer experience is average, an ad doesn’t make it memorable and worth talking about. Our clients who have focused on the full brand experience spend less on advertising and receive more word-of-mouth.